OMG - its November so that means we are officially allowed to chat Christmas! I have already started my Christmas shopping as I am pretty busy over the next few weeks so I wanted to get a head start. 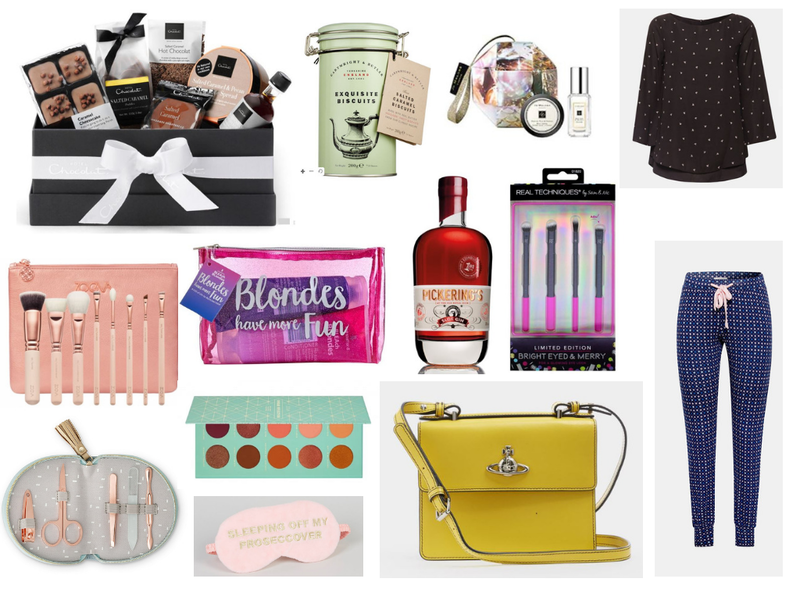 Today I wanted to share a little post filled with items that I would love to receive this year. I think I have done this post for the past few years now so it only seems right to kick off the Christmas posts with this one! Lets start with this cute rose gold and grey Oliver Bonas manicure set. I love things like this as they make great stocking fillers that are practical but also a lovely gift. Another fab stocking filler that will be much needed over the festive period is this 'Sleeping off my Prosecover' eye mask. I think I may pick up a few of these for gifts for me friends! I have two things from Zoeva on my wish list this year. I have already pointed out the beautiful rose gold make up brushes to my husband whilst in Selfridges a few weeks ago but I recently saw this gorgeous palette from Zoeva too. I love the colours in this and I think for the price these palettes are exception quality. Something that isn't particularly something I would find in my stocking is this insanely beautiful Vivienne Westwood handbag I saw this in the store a few months ago and I have not stopped thinking about it! I love the VW bags I have two others and they are amazing quality and very hard wearing so I would love to add another to my collection. Everyone needs new Pyjamas at Christmas, I really like these jersey legging pyjama bottoms from Espirit, they look super comfy and I love the colour combo of the navy with pick accents. Whilst browsing the Espirit website I also saw this super pretty top I would like some more tops that I can wear with jeans or a skirt to look fancyyy! I have loads of T-shirts but I need more 'Nice Tops'. Lets move on to the edibles section! I love receiving food and drink for Christmas especially luxury items like this Hotel Chocolate Salted Caramel gift set, I would LOVE to have this under my tree it looks delicious. If you don't know already I love anything salted caramel, so these Cartwright & Butler biscuits would go down a treat too. I would love really like to try a bottle of the Pickerings Sloe Gin this Christmas too, Pickerings is my favourite so I would love to try this one. It isn't Christmas if you don't get a beauty gift set from the likes of Boots. I love the Lee Stafford Blondes have more fun set. Real techniques have released some gift sets this year and they are my go to high street brushes as they are really good quality! I think I may buy some as gifts this year myself too. I love the Jo Malone Christmas gifts this year, they are obviously a bit pricey but they are honestly beautiful and I would love anything from Jo! I hope this has given you a few ideas as to what you can add to your own wish list this year or gifts for others! *This is a collaborative post and it contains sponsored links.